What do I do if my baby gets sick? When babies show signs of a fever, stuffy nose or cough, it’s natural to want to ease their symptoms. Here’s what you need to know about treating your baby at home, as well as when to see your doctor. If your baby is younger than three months old, see a doctor at the first sign of sickness. A newborn’s immune system takes three months to build up, so any signs of illness should be checked out. Secondly, although a number of over-the-counter (OTC) products exist to help ease cold symptoms, they should never be given to children under six years old. For more information, talk to your pharmacist. 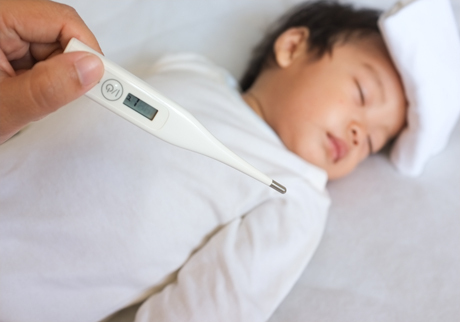 Fever is a rise in the body’s temperature above a certain level. It is usually a sign that the body is fighting an infection. A temperature above 38 ° C (100.4 ° F) measured rectally or in the ear is considered a fever. Lower temperatures, when measured under the arm (37.2 ° C or 99 ° F) or in the mouth (37.8° C or 99 ° F), are also considered a fever. At-home help: Make sure your baby isn’t dressed too warmly since this can cause your baby to overheat and appear feverish, and remember to increase fluids so your baby stays hydrated. If your child is over three months of age, you may try acetaminophento bring down fever, but don’t exceed the recommended dose. Do not give your baby ibuprofen, unless advised by your doctor. Your pharmacist can help determine the most accurate dosage based on your baby’s weight and age, and can also help you find the best thermometer for your needs. Visit the doctor if your child is less than three months old. You’ll also want to call your doctor if your baby’s fever has lasted for more than three days, or is accompanied by a change in behaviour, such as unusual drowsiness, crankiness or a change in feeding habits. If your baby’s plugged nose is the result of thick yellow or green mucus, it is likely to be a cold. But if the discharge is clear, the cause could be environmental, such as sensitivity to cigarette smoke or air conditioning. At-home help: Clean baby’s nose 15 minutes before feeding with the help of a store-bought salt and water solution, such as hydraSense® or Salinex®, available in drops or spray. A nose suction bulb can be used occasionally to get the thick mucus out. Note that frequent nose suctions can irritate a baby’s nose. All of these products are available at Pharmaprix—just ask a pharmacist. A cool-mist humidifier can help your baby be more comfortable at naptime and at night, but stay away from hot-water vaporizers—these are not recommended because of the risk of burns. Visit the doctor when your little one’s nose runs with a thick, green discharge for more than two weeks, or if your baby has difficulty breathing. A tiny cough is often harder on parents’ ears than it is on the baby. Coughing is a natural reflex that helps clear mucus or irritation from the airways. Visit the doctor when your child has wheezing, or if the coughing is causing vomiting, lasts more than a week or sounds like croup.